RRB NTPC ASM Aptitude Test Pattern, Time Limit - Railway Psycho Test Syllabus for ASM: A hands on Material for candidates appearing at Psycho/ Aptitude Test for Assistant Station Master (ASM) posts. Everything you need to know about Railways's RRB NTPC ASMs Aptitude Test are provided below. Here in the post below, we have shared detailed pattern, syllabus, time limit, practice questions and study material for Psycho/ Aptitude Test 2017. Aptitude test for ASMs and Traffic Assistants will be held on 30th June in Computer based Test (CBT) mode. All those candidates who have been declared as qualified as per RRB NTPC Psycho Result, are called for 3rd and final stage of Railway's RRB NTPC (Graduate) Non-Technical recruitment which is Psychometric/ Aptitude Test for the post of Assistant Station Master and Traffic Assistant posts. This test is to evaluate the real measures of candidates strengths and limitations. To help you candidates in knowing the Railway ASMs Aptitude/ Psycho Test Syllabus, we have once come up with detailed pattern of the Psychometric Test for RRB NTPC 2017. Railway conducts ASM Aptitude Test to get the right sort of people to do the job. Candidates who do well on the test usually do well in the job itself. The Railway Aptitude Test is next stage of RRB NTPC Selection procedure for the post of Asst Station Master (ASM). Marks of this ASM Psycho test are considered and also added to the final Result for Merit. It doesn't matter if you top the 1st Stage and 2nd Stage exams, you need to qualify this test to be recommended for Assistant Station Master (ASM) posts in Indian Railway. The aptitude tests have been designed for various jobs in critical safety categories. This the first in the history of Railway Exams, you will be given a computer instead of the test battery, consisting of five-six tests, for the post of Assistant Station Master (ASM) and Traffic Assistant (Kolkata Metro). This Aptitude Test is to be taken by only those candidates who qualify a minimum cut off in both the RRB NTPC Stage I and the Stage II Computer based test for the posts of Assistant Station Master (ASM) and Traffic Assistant. Based on the post preference of various candidates while applying for RRB NTPC 03/2015, the candidates are shortlisted for ASMs Psychometric Test. RRB NTPC Cut off Marks for ASM. There will be five number of tests in the Aptitude Tests viz. 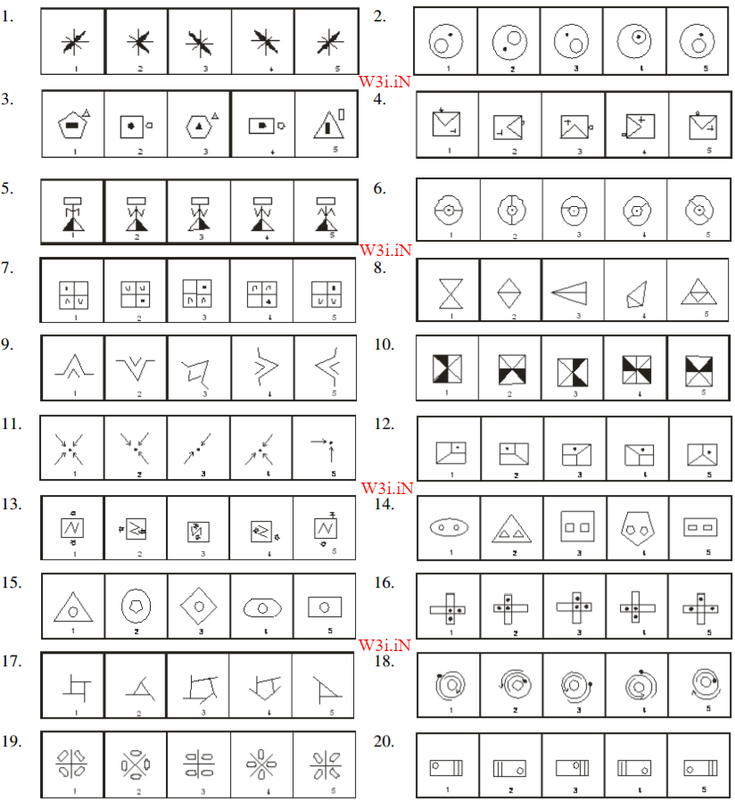 Intelligence test, Attention test, Spatial Scanning, Information Ordering and Personality test. Following are the section of Asst Station Master’s Aptitude Test questions. The name of the tests shown here are only indicative. These may change at any time without prior notice. solve test items and mark your answers within the prescribed time. In this test each problem consists of five figures, four of which are similar in a certain way. You are required to find out the one which is different from other four. In the example given above you will note that figure No. 4 is different from the other figures as the 2 circles do not touch each other. The answer for practice problems are 2, 4, 1, 4, 1, 3, 1, 5, 3, 4, 5, 5, 3, 1, 2, 5, 4, 2, 3 and 3 respectively. In this test your task is to add odd numbers, for example 1, 3, 5, etc., and indicate which of the five options shows the correct sum. While counting even numbers are to be ignored. In the example given above you will note that option ‘D’ is the correct answer. The answer for practice problems are A, D, B, C, A, C, B, E, B, A, D, C, D, E, A, B, C, E, B and E respectively. 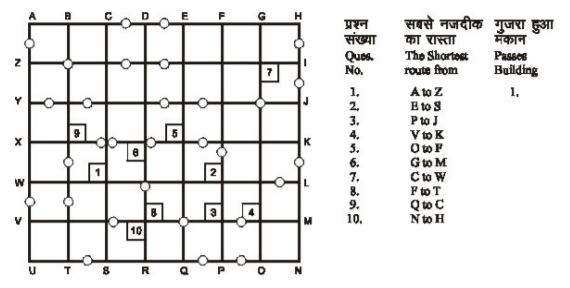 In this test you have to find out shortest possible route between any two stations (represented by alphabets) in the shortest possible time in a given map. Dark lines indicate streets. The circles are barriers, which cannot be crossed. 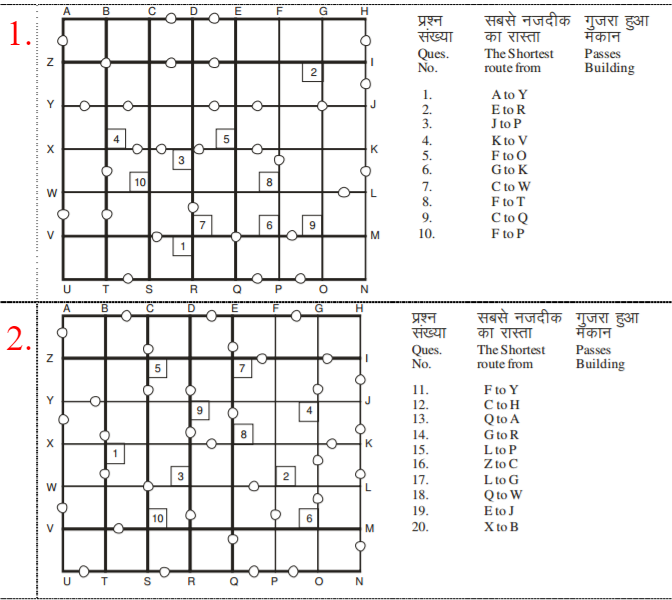 Squares containing numbers represent houses. Number of the house passed by while finding the shortest route will be your answer. The answer to first problem is 1. The answers to other problems are 5, 3, 2, 4, 4, 1, 5, 1 and 4. 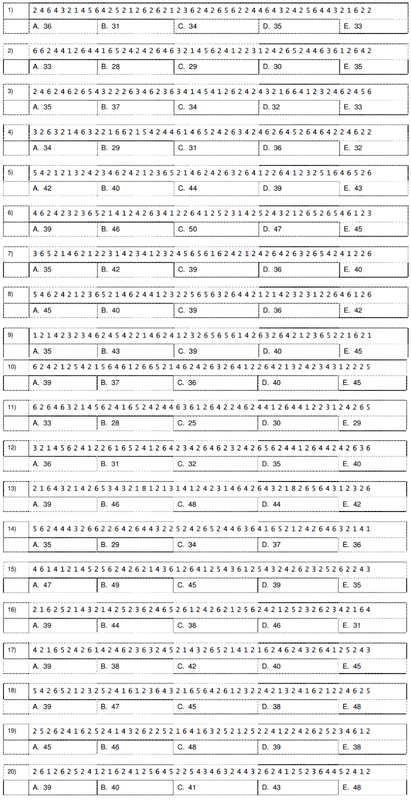 The answer for practice problems are 10, 5, 6, 8, 9, 2, 10, 5, 10, 6, 9, 7, 3, 8, 6, 5, 2, 10, 4 and 1 respectively. 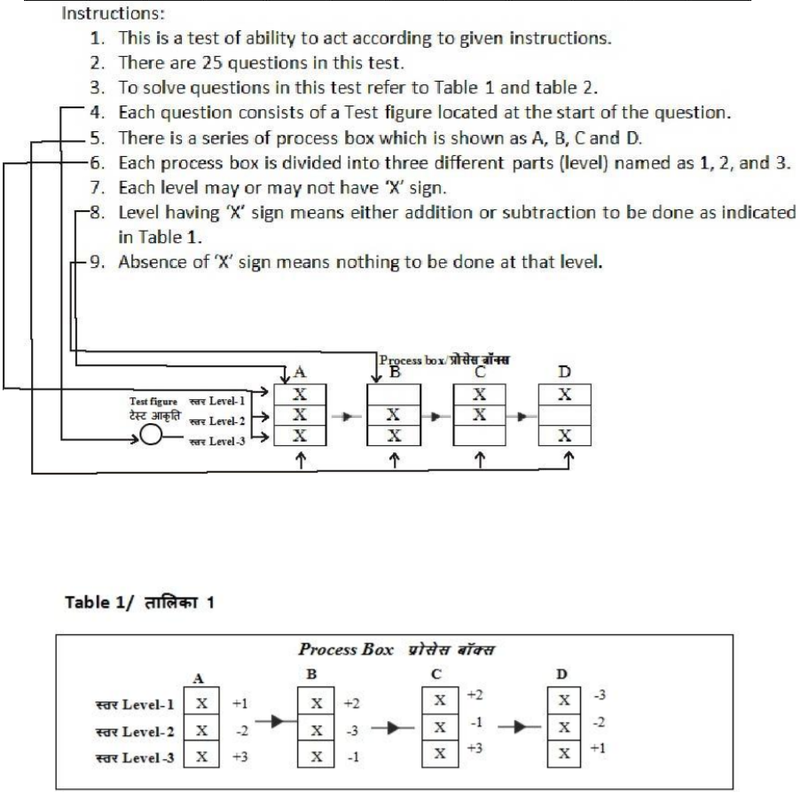 First step is to know the value of the test figure from table 2. Add or subtract A-D process box value which sign of (X) to the value of test figure. 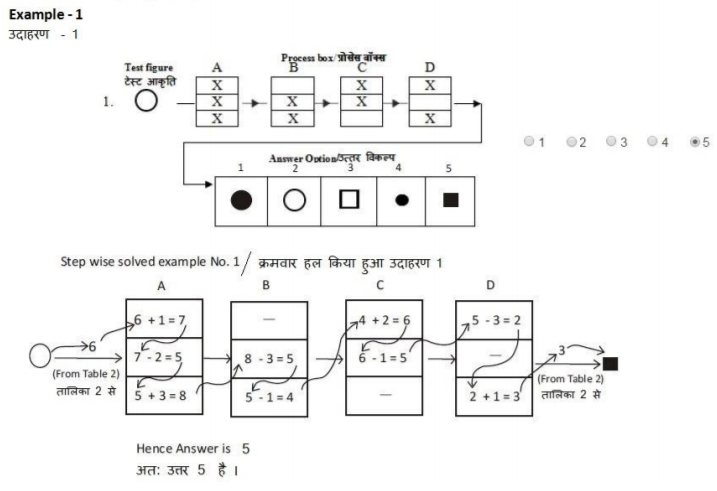 Find out the corresponding figure from table 2 by using the value of last solved level of box D.
Mark correct option according to figure. In this test some statements are given to find out your attitudes and interests. There are three possible answers to each statement. No particular answer is “Right” or “Wrong”. You have to select the alternative which is most appropriate for you. Here are are last minute tips which you should implement to get better score in RRB NTPC Aptitude Test. RRB NTPC Online Psycho/ Aptitude Test. Q What will be the mode of Aptitude Test i.e. Offline or Online (CBT)? Ans. Aptitude test for ASMs and Traffic Assistants will now be in Computer based Test (CBT) mode. Candidates appearing may click on the link below to get acquainted with sample test. Q Which categories have been taken into the ambit of Aptitude testing in CBT (Computer based Testing) mode at present? Ans. At present the category of Assistant Station Master/Traffic Assistant is in the ambit of Aptitude Testing in CBT (Computer based Testing) mode. Ans. No, Aptitude test is meant for recruitment of Safety Categories of Staff, hence there is no provision of reservation in Aptitude testing. 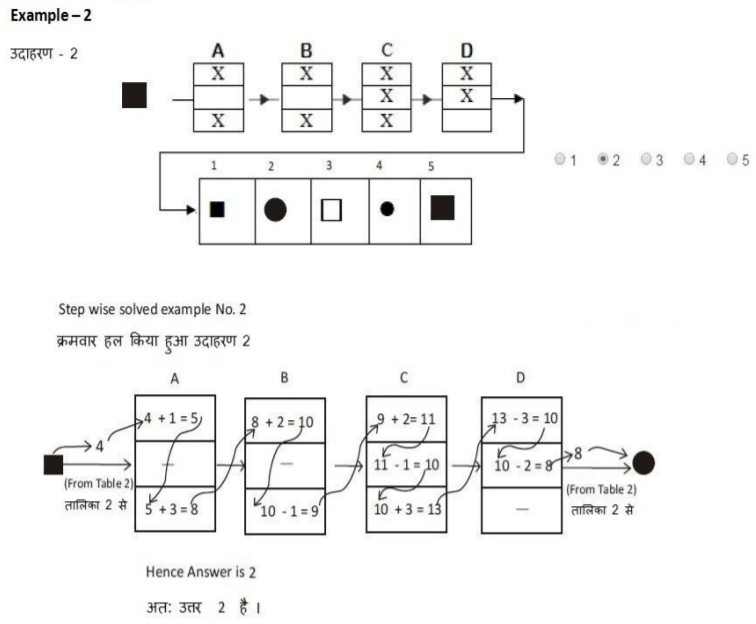 Q What points are to be kept in mind for Aptitude test in Computer based testing (CBT)?? Stay focused on every question of every test throughout so that you are able to gain maximum scores. Q What will be the duration of Aptitude Test? Ans. The duration of the Aptitude Test is 84 minute. Q How the merit will be drawn for the post of ASM & Traffic Assistant? 70% weightage being given to the marks obtained in 2nd Stage CBT and 30% weightage being given to the marks obtained in Aptitude Test. Q What is T-Score and how it is calculated? Ans. T-score is the normalized score statistically formulated for application all over. The range of the T-score is 20 to 80. Q Is cut-off criteria for determining suitability of candidates is same all over the country? Ans. The cut-off criteria for determining suitability of candidates are same in all the RRBs, all over the country. The qualifying marks of aptitude tests for all the RRBs are same and there is no variation at all. Q Is there any negative marking in aptitude testing? Ans. No, aptitude testing is meant for assessment of required cognitive attribute in a candidate and there is no negative marking in aptitude testing. Q ASMs Aptitude Test is Online this time, What will be the major difference? Ans. In the paper-pencil mode until now the Aptitude test battery of Assistant Station Master consisted of a total of 4 tests. The fourth test of personality assesses 2 different attributes and hence five scores get generated. If a candidate fails in any one of the attributes then he is declared unsuitable. But in the present scenario, the Aptitude of ASMs/Traffic Assistants will be conducted in the CBT mode and here the test battery will have 5 different tests instead of 4 as earlier and so six scores will get generated. Q How the marks obtained by a candidate in RRB examination and aptitude testing are calculated for selection of a candidate? Ans. The scores of a candidate in RRB examination and thereafter in aptitude test as a part thereof are apportioned in the ratio of 70: 30 for preparation of the final merit list. Q How to calculate T Score and composite Score of a candidate in Aptitude Test? Ans. The cut-off for Tests are fixed on the basis of Normalized T-score. The Mean of normalized T-score is 50 and its SD is 10. The basic parameters required to calculate T-score are Mean and Standard Deviation calculated from normalized sample. The range of the T-score is 20 to 80. Railway NTPC Post Preference Faq. RRB NTPC Typing Test Instructions.